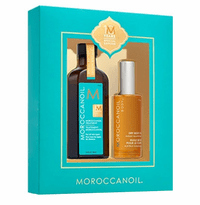 Moroccanoil provides a wide range of products for healthy looking hair. All their products restores elasticity, infuses hair with shine, and protects from environmental factors. Argan oil is the main ingredient which is a powerful antioxidant and UV protector rich in vitamins and natural elements that fortify the hair, including Vitamin F (Omega 6), Vitamin A to improve elasticity, Vitamin E to protect against free-radicals, and Phenols to shield against environmental stressors.